Pure Gold iPhone 5 – World’s Most Expensive iPhone 5? 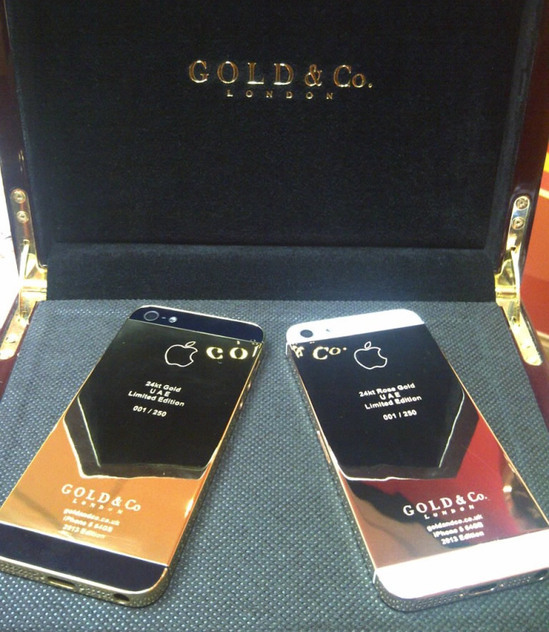 We just got news that Gold & Co. announced that they will be releasing the iPhone 5 in both pure 24 Carat gold and rose gold. Currently this is the first iPhone 5 being offered in pure gold and may be the most expensive iPhone 5 currently available. Gold & Co. is expected to unveil their new iPhone 5 creation at the Collector’s Palace in Dubai Mall, which is the world’s largest mall by the way, on September 27th. 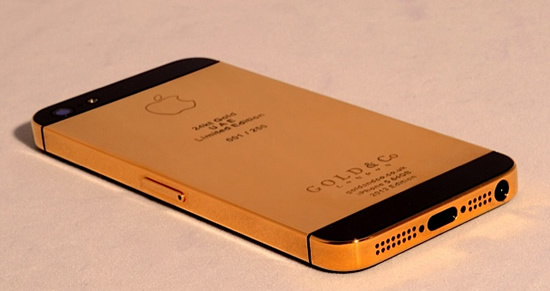 The golden iPhone 5 will be offered in a limited edition with only 250 produced. They are individually numbered and presented in a luxurious handcrafted wooden box with a COA. Amjad Ali, CEO of Gold & Co., London, stated that he is extremely excited to bring the latest in gold plated technology and believes that the pure gold and rose gold iPhone 5 is the best product they have ever produced. Now all you millionaires out there get ready to own the best iPhone 5 around. Gold & Co., manufactures the finest gold-plated products. Each product is a limited edition and is individually numbered to ensure exclusivity. They provide gold electronics of the most popular products available today, including the iPad 3, iPhone 4S, Apple MacBook Pro, and the Apple iMac. Now if your just looking for a gold iPhone 5 case, this may be a cheaper option for you: Gold iPhone 5 Case.